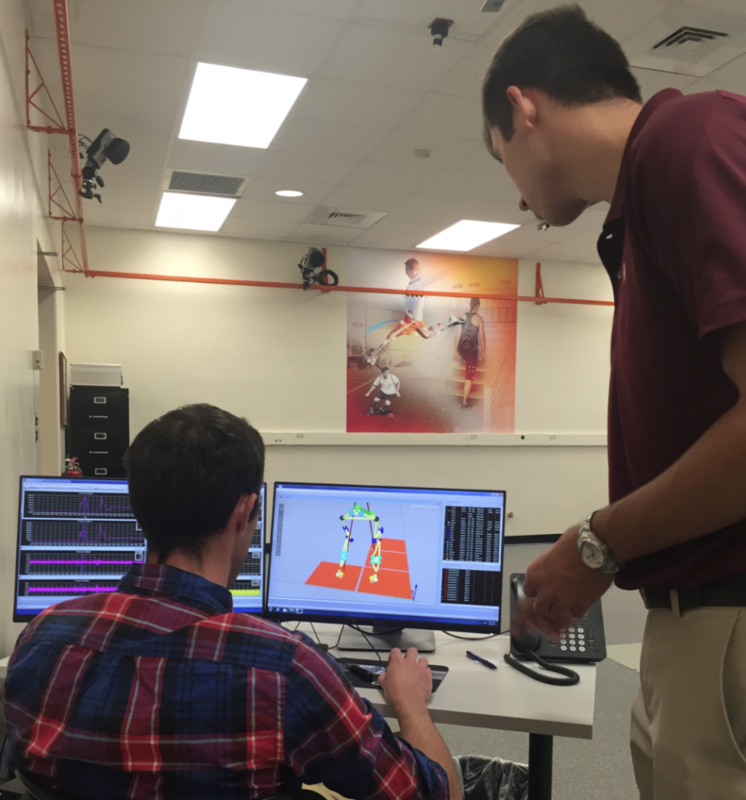 Dr. Queen directs the Kevin P. Granata Biomechanics Lab (Granata Lab) at Virginia Tech and thus has full access to all of its resources. The Granata Lab encompasses 2,500 sq. ft. of space in Norris Hall on the Virginia Tech campus. Norris Hall is one of the engineering buildings on the Virginia Tech campus and houses faculty office and classrooms for the Department of Biomedical Engineering and Mechanics. Most of the laboratory space is used for motion capture as well as biofeedback training. All of the laboratory equipment is around the perimeter of the lab, which allows for ample open floor space for all necessary training. In addition, the elastic bands that are needed for the tactile biofeedback portion of the project are currently available in the lab. The equipment that is used in the Granata Lab for monitoring three-dimensional kinematics is a state of the art motion capture system. This system is comprised of ten Oqus 7+ cameras that can sample between 3 and 12 megapixels at variable frame rates between 300 and 1100 frames per second at full resolution. These cameras are connected to one another and connected through an Ethernet cable to the main data collection computer which is further linked to the Qualisys online web service. The Oqus 7+ cameras are used in conjunction with the QTM software, which allows data to be collected in real-time. The real-time collection and display of 3D data allows the lab staff the ability to complete biofeedback projects and provide immediate information to the subjects and patients that are being assessed in the lab. In addition to the QTM software, which is used for data collection and reduction, the Granata Lab uses Visual3D (C-Motion, Germantown, MD) software for the processing and reduction of all motion analysis data. Finally, the lab utilizes custom written Matlab software to complete any additional data processing. This study examines landing mechanics in healthy subjects. We aim to test and develop new devices for doctors to help them decide whether a patient is ready to play sports again after ACL reconstruction surgery. This study is currently recruiting healthy individuals between the ages of 18-35 to perform hopping and landing tasks while equipped with 3D motion capture markers and in-shoe pressure sensors. We need to come up with measures about how they move, not just strength and mobility, but really look at them when they are on the field doing the activity they do, and define it.